In CA this year, we are experiencing consistent high flows! 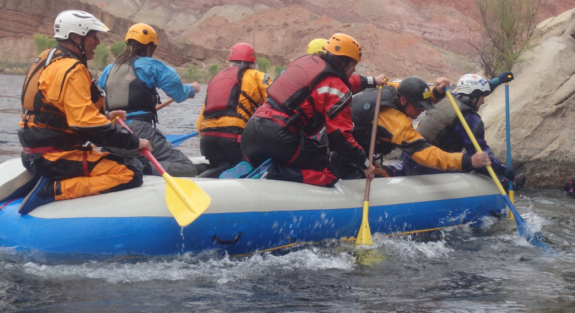 It is great, it is fun, and there is enthusiasm and excitement amongst raft guides, and their paddlers. Finally, the rivers are running, and currently, they are not in “flood”; but many of the rivers in the State are flowing at what is considered “high water”. Big waves, fast current, punchy hydraulics and a completely full river bed, are some of the characteristics that represent high water. When the water is moving fast, and is cold; while providing opportunities for more fun; river safety and rescue must be managed a bit differently than in a lower flow environment. Here are some basic safety tips for dealing with the higher, faster, colder flows. All raft passengers must be dressed for the temperature of the water, and be trained in basic self rescue skills. If someone ends up in the water, they may need to take a more aggressive roll in their own self rescue. They need to demonstrate the ability to swim, follow instructions, and not panic if they enter the water. Training could potentially reduce the impacts of Cold Water Shock by relieving some of the anxiety that comes with an unexpected swim later in the day. Any swimmer or boat flip is a team event. All boats must run close enough to offer immediate assistance in the case of swimmers, or a flip. Stern frames in paddle boats offer increased mobility and power to not only stay upright in big waves, but also offer fast and powerful chase. With a stern frame, there is the added ability to turn and row fast downstream to chase any swimmers. 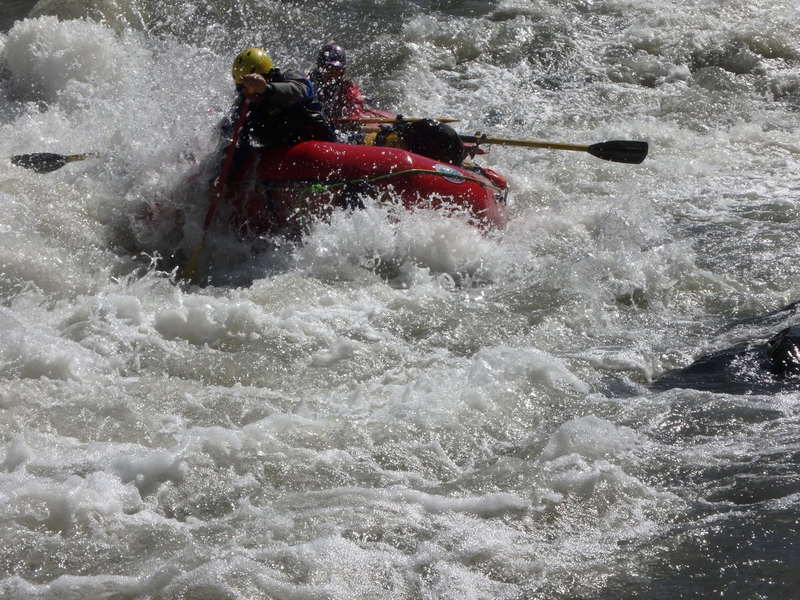 Professionally trained safety kayakers are a great addition to any rafting trip at high water. Their professionalism and training has prepared them to help keep a group together, provide downstream containment of swimmers, help with communication, and assist in getting anyone in the water back to a boat, or another safe place. Every group entering a high water environment must have a plan for safety! This will involve preplanned rescue techniques and priorities. The highest priority should be keeping EVERYONE OUT of the water, and if anyone does go into the water having a tight boat order and pre-plan for getting everyone back OUT of the water quickly. Swimmers MUST be prioritized over equipment! Carry enough extra paddles so that rescuing paddles is not a priority, and only a convenience. This is a good time to use foot cups, thwart handles, perimeter lines, and a bow to stern line on the bottom of the boat for easy access if the boat is upside down. While any kind of rigging has its added dangers, making rafts easy to stay in, climb on and stay with is important. Foot cups and thwart handles will provide stability and a good hold on place in the middle of the boat. Perimeter lines make it easier to say with the boat if in the water. If a boat is upside down, people on top of an upside down boats are out of the water and easier to account for. The bow to stern line makes it easier to get there, and stay there. Rescue must be pre-planned and prioritized for a flipped boat. Each river is going to have a different set of variables. The plan for a flip needs to be oriented towards getting folks out of the water, and keeping them out of the water. In general, a Plan A should involve folks on top of the upside down boat, in other boats, and being pushed into an eddy. This keeps everyone out of the water the fastest, in general. Other situations may warrant a rescue with a second boat. If passengers are rescued by a second boat, a paddle boat can easily be re-righted from inside that second boat, and then re-populated with its paddlers in a continuous river between rapids. Guides re-righting boats mid-current may be warranted in some extreme situations; although, in general, this means passengers stay in the water longer and have more opportunities to get separated. This process is also often more tedious, and difficult than can be planned for. Additional Kayak Specific Safety Tip: While most of the above directly applies to kayakers, as well; in addition, you must have a BOMB PROOF roll for the difficulty of water you are paddling. As always, know your fellow paddlers, have a plan, and paddle within your ability levels. It is all about TEAMWORK and having a PREPLAN in a mishap. Everyone must participate. Raft passengers, other guides, kayakers. 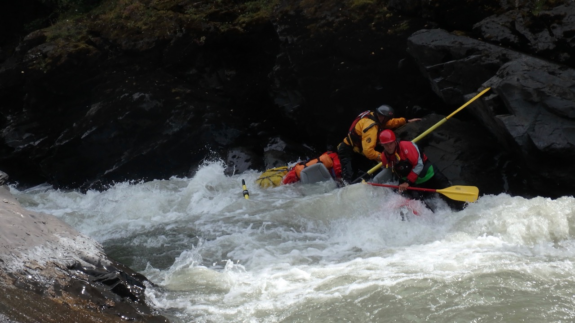 Any kind of flip, or swimmers, at high water is a team rescue event. The fast water causes people to be separated from the boat quicker than at lower flows. All of these safety and rescue tips must be assessed for the individual rivers, the flows, and the folks paddling in it. Have a PLAN! Do everything you can to stay upright, and on line with everyone in the boat. And then have a Plan A. And then add a Plan B; and potentially even a Plan C! Be safe, be pro-active, be prepared; and then go have fun out there!